Is PCStitch for you? We invite you to download it and try it out yourself, at no cost or obligation. This software is the full version and you can test drive every PCStitch feature during your evaluation. There is no time limit for your evaluation. We invite you to take your time and see if our software is for you. The only limitation during your evaluation is the Save feature is disabled. Get Instant access to PCStitch when you purchase it! If you decide to purchase PCStitch, we can provide you with an unlock key which you can use to gain instant access to the Save and Print features. You can start using PCStitch Right Now! 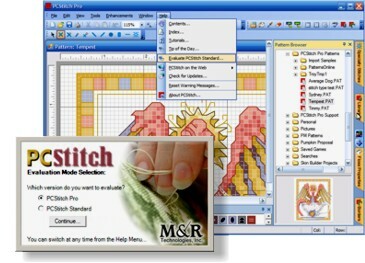 Click Here for step-by-step instructions to download and install PCStitch on your computer!